Can DevOps Testing boost your Application Development process? 175 years after the first computer program was written by Ada Lovelace, today we are actually using Mobile applications and depending on them for specific needs. Mobile applications are increasingly getting complex and they work with multiple third party controls. This is bound to pose challenges while developing and testing them for feasibility and security. Can DevOps with its dual approach help meet these objectives? According to a Gartner survey, 42% of organizations were expected to increase spending on mobile app development by an average of 31% in 2016. While the enterprise mobility space gets meatier, there is a serious need to ensure functionality, accessibility, and security of these applications. Especially, in the digital space where the challenges are sporadic. 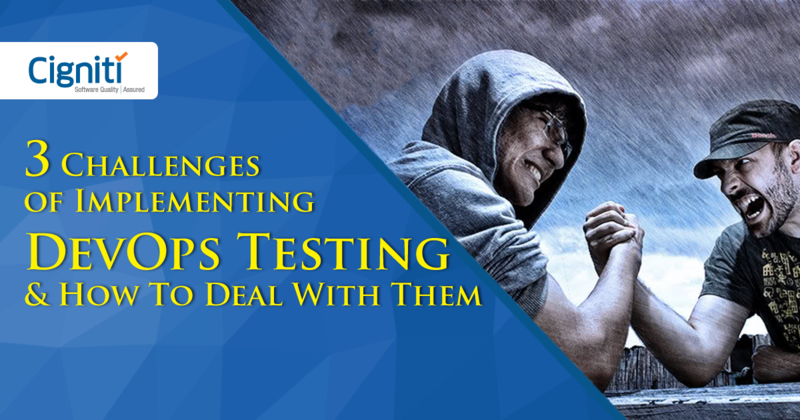 Testing is no more an afterthought today, it is embedded within the software development process. With inventive approaches such as shift-left (DevOps), shift-right, and Agile, testing has become an integral quotient of the development process. DevOps is not a process, it is an approach that enables continuous and seamless delivery of applications right from the beginning up to the end. Unlike the DevOps trend, traditionally development and Operations would work as separate functions. This led to absence of communication and coordination amongst teams that affected the overall growth and innovation. 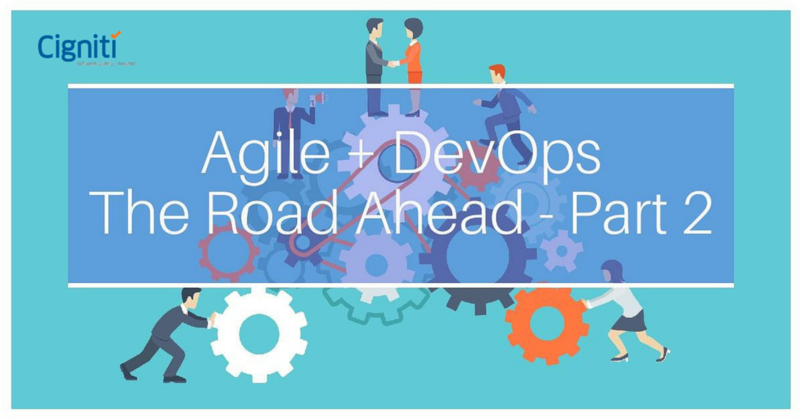 With the DevOps movement, the dev and ops teams have started collaborating and working together to effectively address issues related to continuous application delivery. Practically, DevOps brings together the interests and know-how of developers and operations managers. The focus is on lean development to ensure continuous integration and continuous delivery. Why is continuous delivery so critical in the current scenario? Continuous delivery calls for continuous deployment of software and continuous development. During continuous delivery, the team can deploy anything – basic configuration changes, constant code changes, changes in the development environment, etc. This is absolutely critical in the current digital scenario, where development and testing has to be done constantly and enhancements happen in real time. DevOps applies some basic principles while coding enterprise web apps or mobile apps. According to experts, even while applying DevOps for enterprise-level apps, it is important to pool in the mobile team, as it could be relevant at a later stage while working on the mobile version of the application. Especially, if you are developing mobile app for the already existing enterprise applications and services, it is relevant irrespective of whether the application is consumer-facing or is being developed for internal use. With DevOps, when new features are introduced within the enterprise application, it helps teams to smoothly integrate them into the mobile app as well. When it comes to mobile app delivery, there are unique challenges, as there are multiple layers involved in the process. The overall ecosystem is segmented and there are multiple expectations from the application. As Forrester states rightly, this indeed is ‘the age of the customer’ – at both an individual level, and at an enterprise level! Market is flooded with competing applications and acceptance or denial of the application can just take a few clicks. DevOps provides insights into the operational side of the story, which is absolutely critical, as it will determine the various aspects related to the application – maintenance, management, security, accessibility, etc. DevOps is being increasingly endorsed by teams to effectively develop and deploy cloud applications. While it removes the bottlenecks between development and operational teams, it helps cut down the enterprise application backlogs and speeds up software delivery. There is a strong ecosystem of DevOps tools that covers key segments – Planning, Development, Operations, Release, and Testing. Numerous tools exist within each segment to make the process seamless and effective. The key with DevOps is implementation, which is possible with a strong partner. DevOps enables continuous software delivery and brings two aspects into reality – faster turnaround time and constant improvement. It supports the idea of incremental improvements over a period of time. Faster time to market is one of the key reasons for considering the DevOps approach. Generally, in a non-DevOps set-up there are issues concerning introduction of new features and maintaining stability at the same time. Development team gets normally assessed on the basis of the features added and the operations team gets appreciated on the basis of the stability it brings to the application. DevOps brings both the aspects together and enables both the teams to deliver effectively. In a DevOps set-up, it is a single team that is responsible for delivering new features as well as stability. Resolving complex issues is faster, as both the teams work together to meet the same objectives. In a typical IT environment there is absolute misjudgement of time, where people wait for other people and other machines, new software or same resolution of issues. When there is a change in approach and shift in delivery models, it helps add value to the process. Automated deployments and consistent production environments are key components of DevOps. It makes deployment predictable and as a shared responsibility amongst groups. This adds value to the process and boosts efficiency. However, as experts say, DevOps is easier said than done. The underlying purpose of DevOps is to minimize the barriers between developers and IT operations. The mistake that generally occurs during implementation is an uncalled focus on technology, rather than people and the process. It is important to choose the right DevOps tool and train the concerned staff. Investment in training is critical and cannot be neglected. Another challenge faced while implementing DevOps is ensuring Security and governance in tandem with your application. It is critical to include security within every aspect of the development process. Don’t ever miss out on Continuous testing and Continuous Deployment for that matter! Governance has to be brought into every process – policies, specifically where there is use of APIs or any other external dependencies. DevOps is a step-by-step collaborative process, and every stage has to be scruplously managed with all related components. DevOps involves constantly questioning the processes, deployment, and the operations at every level. It is important that the approach is accepted by the stakeholders and brings productivity. It cannot be a wheel that is set in motion and forgotten. DevOps evolves with emerging ideas, with people, with processes, and effectively with technology. An experienced partner can help set this process right and strategize the approach for you. At Cigniti, we systematize efforts and ensure accelerated time to market with DevOps Testing. We also focus on DevOps core objectives delivering improved deployment quality and greater operational efficiency. Connect with us to establish both Quality and Speed, and get your application faster to the market. 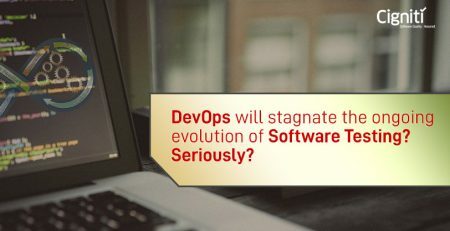 DevOps will stagnate the ongoing evolution of Software Testing? Seriously?